Firefighters with Dallas Fire-Rescue pulled two stranded window washers off a high-rise building in North Dallas Wednesday afternoon. The window washers were in distress and dangling from the Prosperity Bank building at 9330 LBJ Freeway near Abrams after their scaffolding apparently failed and fell to one side just before 2 p.m.
From NBC Dallas-Fort Worth Chopper 5, the scaffolding could be seen hanging vertically with only one set of support wires to the roof intact. It is not yet known what caused the scaffolding to fail. 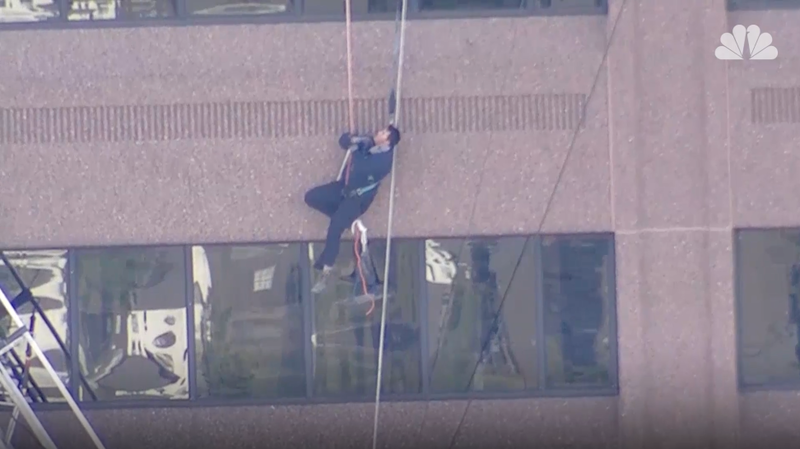 After raising one of the workers to the roof, a member of the Dallas Fire-Rescue Urban Search and Rescue Team rappelled down the building and secured the second worker to another line before lowering him to the ground at about 2:50 p.m. Attempts to raise the second man to the roof apparently failed. Dallas Fire-Rescue spokesman Jason Evans told NBC 5 it appears safety equipment worn by the men worked as it should and kept them safe after the scaffolding failed. Neither of the men were believed to be seriously injured, though the second man rescued was transported to Presbyterian Hospital in Dallas for an evaluation. NBC 5 Meteorologist Rick Mitchell estimated winds of 10-15 mph. Mitchell noted that the wind was not severe enough to move the stranded worker or disturb the scaffolding. Fire departments in cities with taller buildings, such as Dallas and Fort Worth, train for what happened Wednesday afternoon. "We were lucky to have the window washer prop so we can practice the window washer rescue," said Fort Worth Fire Capt. Robert Webb. "Like today, they had one in Dallas today. So it happens." The Fort Worth Fire Department showed NBC 5 how firefighters train for such situations. They dangled a dummy from a window washing platform on the fifth floor of their training facility. "If any of his equipment fails before we get to him, obviously that's the most dangerous part," said firefighter Chris Torrez, as he dangled outside a fifth floor window, making the practice rescue. "Just taking care of business, going down there and helping whoever we need to help." Torrez said he hasn't had to rescue anyone off the side of a building in real life, but training for it makes him ready for anything.